As we head out of downtown Brussels and its myriad high-rise developments, our surroundings give way to far more typically Belgian suburban scenery. Almost an hour out of the city, approaching the quiet village of Wieze, there appears little sign of activity on its immaculately clean streets, until we encounter a quiet side road, that just happens to lead to the largest chocolate production facilities in the world. Once inside the gates of Barry Callebaut’s core Belgian operations, there is plenty of activity reflecting the fact that over 1,100 people are well into the flow of their working week at this unexpectedly rural, yet thriving industrial site. 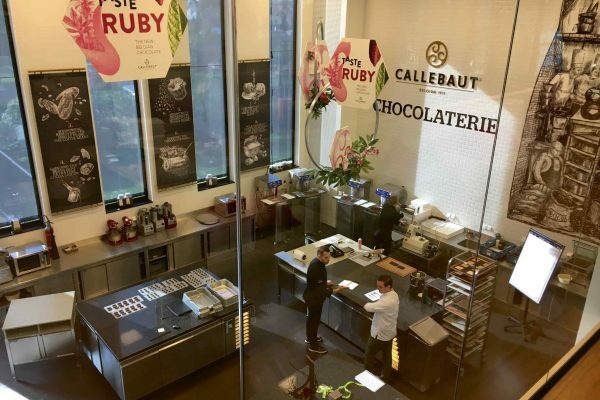 On arrival, the first sight greeting visitors is the company’s recently developed flagship Callebaut Chocolate Academy. This has been devised as part of a global network offering the latest training techniques for chocolatiers and pastry chefs. As the site’s media team explains, there is a good deal of pride in the fact this centre of learning is situated at its Wieze facilities, which remain as much an integral part of the overall business as from its founding origins. Having started out life as a brewery in 1850 under the direction of Eugene Callebaut, the company made its first tentative steps making chocolate under his grandson Octaaf in 1911. 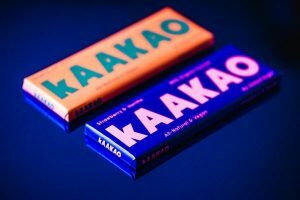 It is now just over 20 years since it joined forces with French business Cacao Barry in 1996, making it the biggest single player in the supply of chocolate and cocoa products. Today, the combined enterprise has an annual turnover of more than €6 billion, employing over 11,000 people globally, with corporate headquarters located in Zurich, Switzerland, which are supported by 55 factories around the world. With the company’s recent development of ruby chocolate, which it devised as a completely new fourth variety, there appears unprecedented worldwide demand for its products. Just this month, the business has launched its latest innovation in milk chocolate towards chefs and artisans – Callebaut Eclipse, created to deliver just 1% added sugar in response to demand for healthier confectionery options. While the company’s outlook appears truly international in its operations, the Belgian team enthuses that they feel very much like they are a part of one big family. This is underlined by the fact that the majority of employees contribute towards its all-important tasting activities that are the key driver of its product development. Intriguingly, much like the provenance associated with French Champagne, Belgian chocolate has to be produced in its country of origin in order to gain its status, which is another factor making its production headquarters so significant. The scale of its operations is considerable, with the Wieze site producing an average of 340,000 tonnes of chocolate a year. This equates to around a quarter of all global chocolate products now containing ingredients from Barry Callebaut. 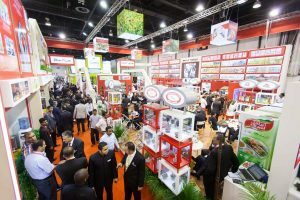 Significantly, the company continues to expand its commercial connections, forging links with a host of major businesses including Mondelēz International, Unilever, Hershey in the US, through to Morinaga in Japan, Group Bimbo in Latin America, and GarudaFood in Indonesia to name a few. As Luc Rooms, quality assurance manager for the company’s global cocoa supply chain, explains, there’s a huge amount to consider in terms of ensuring consistently high standards. For instance, he says one of the key elements to operating a site that extends to well over 20 production lines lies in delivering a high degree of monitoring. This is both in terms of analysing its array of client recipes, through to managing precise truck movements of hundreds of vehicles on a daily basis to ensure its global list of clients is served. According to the quality manager, there are plenty of challenges that the company faces even before landing at its designated European shipping location of Antwerp in Belgium. With around 70 per cent of the cocoa crops for chocolate sourced from the Ivory Coast and Ghana, he explains there remains plenty of work to be done in ensuring product quality sourcing a blend of cocoa beans suitable for its purposes. To this end, the business has its own distribution company in the Ivory Coast, and works closely with farming co-operatives to ensure a constant supply of quality beans. “I am amazed by all that is involved with cocoa – from the beans themselves, right through to their supply. My focus is on the full chain, as on the one hand, the quality of supplies coming into Europe needs to be good, and secondly, we have the issues of full sustainability and traceability of our products, which has meant our supply chains have become more complex,” adds the manager, who says he finds his role just as rewarding as when first joined the business back in 1986, working as part of its lab team tasked with bean analysis. During the past three decades, his skills have been employed in different areas of the company. But he says being responsible for the quality of supplies has enabled him to take the valuable opportunity to enjoy field work in Africa. According to Rooms, gaining a truly complete working knowledge of all its complete equipment lines and monitoring systems requires a high degree of skill, patience and practical experience. “It takes years to properly learn about all the production processes here, though some say you can learn in a few months,” remarks the production manager, who reveals the constantly-evolving site continues to fascinate him, with its ever-expanding capabilities and subtle changes in production requirements. Perhaps the first thing that truly hits home as we step through the doors of one of its extensive production areas is the smell of millions of tonnes of cocoa being processed. It is far from an unpleasant aroma, but its strength takes a little time to adjust to, and varies depending on what stage of the production process is involved. Understandably, there are stringent standard of health and safety policy and approach to hygiene surrounding production zones. As is standard procedure, a clinical level of hand-washing is required by staff and visitors entering each area. In addition, there’s the requirement for a lab coat, hair net and ear plugs to guard against the constant background volume generated by the assembled arsenal of specialist grinding, roasting, conching and inspection equipment being pressed into action as part of the site’s model of 24/7 continuous production. With commendable enthusiasm, Rooms explains that the company’s core operations remain similar in their approach, whether running the special section dedicated to pilot testing of new products, or its full industrial scale processing lines. Once at the factory, cocoa beans are roasted and refined to create cocoa liquor, which is then processed through its huge conches – which have capacities of millions of tonnes. They are at the very centre of the company’s operations, and witnessing them deployed in full flow from atop a mezzanine production gallery is quite some sight. He says eagle-eyed monitoring of this phase is particularly critical, in order to make subtle adjustments to customers’ recipes for milk, dark and, white and now ruby chocolate varieties. While the quality assurance manager asserts there’s no substitute for experienced staff at this stage of the process in gauging the precise flavours, there are other aspects that have become increasingly automated. This includes a robotic packing system, as well as automated metal detection systems for ensuring product health and safety standards are maintained. Having such equipment in place has freed-up its workforce to concentrate on the many other strands of the business. One area of the company that requires a significant level of human input are its research and development labs, which appear a hive of industry on our tour. Rooms explains the company is able to analyse every aspect of bean processing that influences their flavour, with maintaining product consistency being of paramount importance. He gestures towards the taste panel room in one corner of the lab, which has chocolate samples next to it that contain several pots of ruby chocolate, which is being produced with different characteristics between the recipe designed for KitKat, and its recently introduced Callebaut ruby RB1 version, which is pitched at gourmet chefs. “In the factory, we first of all have the roasting process, where we taste every tank of liquor that we produce, which is the first step of quality control. “Then when you make chocolate, your operator needs to make a good mix of the sugar, cocoa liquor and butter, which needs to be of a good consistency, as without this, you cannot refine it,” says the manager, who explains that those steps, which are followed by conching and heating, form the bedrock of successful chocolate production. As he adds, the remaining piece of the puzzle following the product testing phase – which includes metal detection product analysis, is its final preparation for customers. Rooms says many of its clients receive bulk batches in liquor format, though others, generally smaller customers, opt for chocolate supplied fully moulded, or as decorative drops, which it is also capable of providing as a full production operation. As his colleague Renata Januszewska, global R&D sensory methodologies manager, explains, the company places a significant amount of effort into its product development. 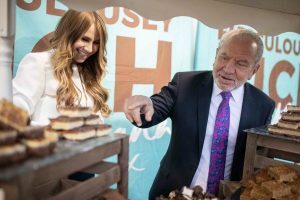 Confectionery Production recently covered the launch of her book, “Hidden Persuaders in Cocoa and Chocolate,’ which links to a specially devised sensory cocoa and chocolate tasting wheel. This aims to create a dedicated language and tasting ritual inspired by wine, coffee and beer markets, and its author believes it is really capturing the industry’s knowledge and skills. “As well as being used internally with the tasting panel, the book might be used by stores selling chocolate, as it’s quite a simple system that people can truly understand. “It has been written to bring together knowledge on how to understand the difference between flavours such as caramel, toffee and malty tastes in terms of nuances, in a way that enrich the enjoyment level and feeling the magic of chocolate in different applications, cultures and countries,” adds the sensory scientist, who like her colleagues, appears especially passionate about delivering the best possible chocolate experiences for its customers. Over the past couple of years, the company has driven forward its Forever Chocolate Programme, which seeks to address sustainability issues within core cocoa producing nations. The key aim of the scheme is to help lift 500,000 farmers out of poverty by 2025, which the business says will require a major shift in approach to farming, in order to assist with wider major problems with the use of child labour, and a growing issue of deforestation. Nicko Debenham, Barry Callebaut’s vice president for global sustainability, spoke exclusively to Confectionery Production at the UK’s Academy of Chocolate Conference. Though he stresses that working with governments was of significant importance, he expressed concerns over a decision by the Ivory Coast Coffee and Cocoa Council to suspend cocoa planting initiatives for 2018-19. This was reportedly done to stem what the organisation saw as an issue with global oversupply. Presently, cocoa production volumes in the Ivory Coast are believed to be operating at around two million tonnes a year, which the cocoa council has reportedly said should be restricted to pre-peak levels of around 1.6 or 1.7 million tonnes. “We have some huge challenges ahead affecting smallholder farmers, as well as issues with deforestation, child labour and climate change, and these are systemic problems,” says Debenham of the company’s work in challenging conditions. He adds: “There are a large number of farmers that have plantations that are too small and have stock where no-one knows the genetics of the trees and are therefore only able to gain a quarter of their potential yield, as well as farming just being seen as an old man’s pastime, with no-one starting out their career in the farming business. “We have set an especially stringent target on sustainability as part of our company strategy. There are now a lot of examples of how we have found solutions to help communities, which includes working with African governments. “But there needs to be considerable behaviour change, and what we are trying to do is provide an environment where farmers are able to help themselves out of poverty and to support their families,” which he adds includes encouraging older generations of famers to encourage their children into continuing in the farming sector. He says the company is also placing a focus on other major issues linked to sustainability including deforestation, noting that satellite technology is assisting with highlighting vulnerable areas of land.